Wet Pan Mill is also called Wet Grinding Machine. Based on the different structure it is divided into double roller grinding and three roller grinding. Wet pan mill mainly used for grinding operation, such as all kinds of ferrous metal, non-ferrous metal, non-metallic minerals, and the separation of gold, silver, lead, iron, copper-gold and so on. Wet Pan Mill for gold selection, which is the excellent equipment for replacing ball mill, is the first choice of milling equipment for small and medium-sized gold mining plant. Wet pan is a new-type mill, with a small investment, high production advantages. The wet pan grinding mill is named by the diameter of the roller. Φ1300, Φ 1350, Φ 1400, Φ 1500, Φ 1600 is suitable for selection of iron ore, molybdenum ore, lead ore, zinc ore, antimony ore and so on. Φ 850, Φ 900, Φ 1000, Φ 1100, Φ 1200 is suitable for selection of gold ore. Wet pan mill for gold selection, which mainly consists of the power plant, body frame, water basin, runner wheel, and grinding base, works under the wheel grinding system. First reduction box would be driven by the motor , then under the drive of reduction box, the torque is transmitted to the upper cross axle through the large vertical shaft and then to the runner wheels through the straining beams installed on both ends of the cross axle The runner wheels are driven to rotate anti-clockwise along the horizontal direction of the cross axle . When the runner wheels are working, They could not only revolve around the large vertical shaft of the wet pan mill but also revolve their own axles. The groundings of the runners and the bases of the runners and the bases of the runners and the bases of the runners Autorotation, as well as the repeated squeeze, curating and grinding. 1. After Wet Pan Mill treated ore is moisture equilibrium, the ratio of uniform, low gas content, to increase molding and molding quality, grind the material through the machine molding products. It has a high density, strength, and no porosity ratio. 3. Wet Pan Mill is used for iron ore tailings recovery process, not slag the loss, the effective resources can be fully utilized. The wet pan mill is praised by users because of it has the features of low investment, fine output size after ground ( can as fine as -1 mm), low consumption, good efficiency, easy installation and maintenance. It is the excellent equipment which can instead f a ball mill. It is a perfect equipment for medium-sized and small enterprises. 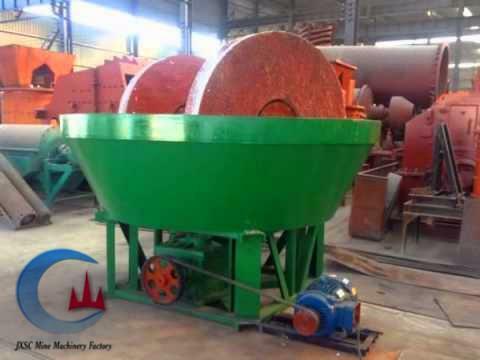 The wet grinding mill is mainly used for separating gold, silver, lead, zinc, iron, molybdenum, copper, antinomy and so on. The wet pan mill applicate for grinding Rock ores, such as rock gold ore /rock tin ore/ rock tungsten ore/ rock chrome ore/rock coltan ore, etc. 1. The normal operation of the mill, before they start feeding. 2. 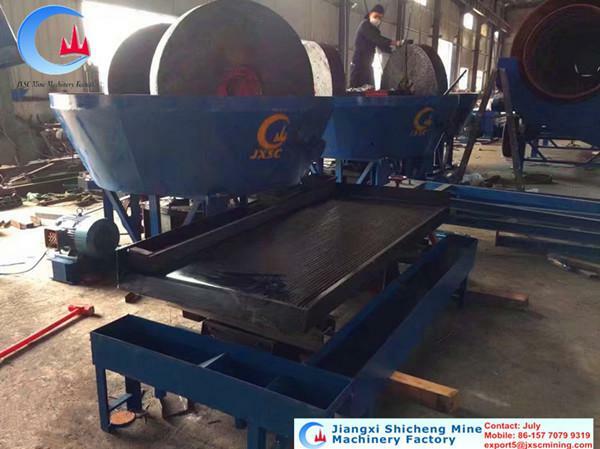 This machine prohibits strip to start, the outage at boot time, you must first clean up the residual ore in the middle of the milled slot and then start. 3. Should be uniform feeding not erratic, it is best to use the feeder. 4. Bearing frequent butter, gearbox or car rear axle with frequent checks whether the loss of gear oil. 5. Regular checks of the various parts of the screw are loose. 6. Found bearing damage must be promptly replaced, shaft eccentric avoid damage to other parts. 7. Mill runtime to pay attention to that the reducer or bearing part of the presence or absence of abnormal sound, whether the temperature is too high, the motor current is too large irregularities; should be shut down immediately if the above phenomenon, exclude. 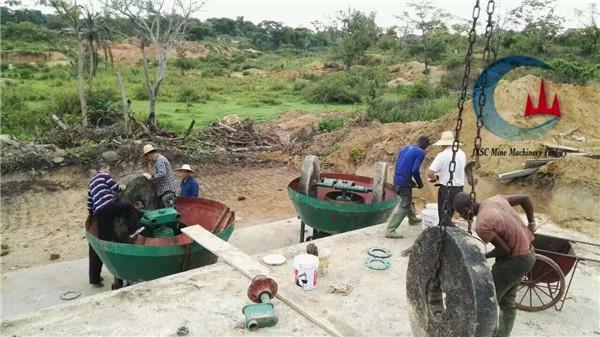 JXSC produced wet pan mill for gold selection has exported to many African countries like Tanzania, Uganda, Sudan, Zimbabwe, Congo, Kenya and so on, also some Asian countries like the Philippines, India and Indonesia. 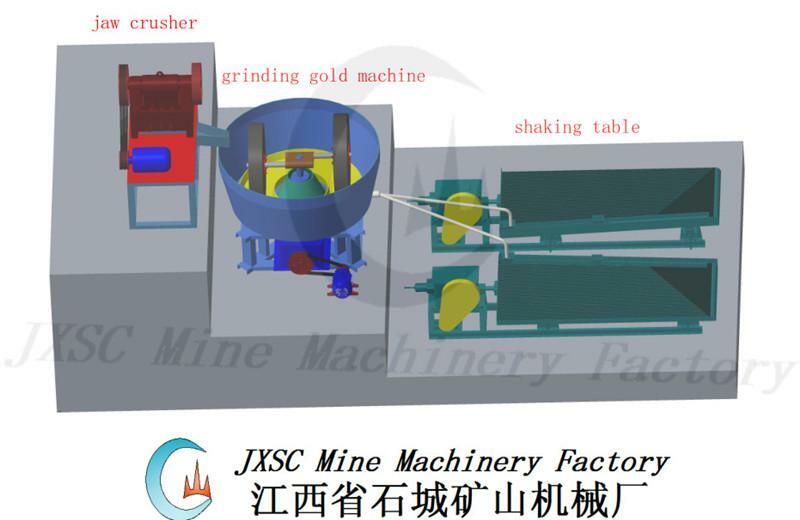 Below is our designed wet pan mill 3D flow chart for Small Scale Rock Gold Processing, which contains Jaw Crusher, Wet Pan Mill, and Shaking Tables. Wet Pan milling machine plays an important role in the rocky gold mine mining process, contact us to get the latest price of the small gold mining equipment.